if there is no wifi connection, does that mean it is impossible to read a book that is on google books? I’m trying to figure out how one would get a book from google books from desktop that is connected to internet to the e-reader device. Thoughts? With most ebook readers (including this one) you can connect them to your desktop and upload new books in a compatible format from say google books or project Gutemberg using a USB cable. thanks very much for the response. I’m confused, however. Not having used an ebook reader i’m speaking without hands-on experience, but when I look at a book on google books, for example, I don’t see any options for saving or downloading the book in a way that would allow me to then transfer it to a reader through USB. All I get is the book on the screen. Am I missing something obvious? Please explain. It’s quite important to get to the bottom of this, because i want to purchase a basic e-reader for reading pdfs and docs (without having to print) and for books on googlebooks, so figuring out the importance of wifi connection is critical for decision-making. Thanks. Ebook Doctor, can you (or anyone else on this website) help clarify the query from above? Specifically, how one uses an e-reader that lacks wifi to read documents (e.g. googlebooks) that are only available for viewing on the web (i.e. non-printable, non-downloadable). Thanks. I don’t think you can save books on Google Books, only view some of them (at least you could a while ago, I just checked now and I couldn’t read any!). I would recommend checking out http://www.gutenberg.org to download books (they will have a better selection than Google and you can download them for sure). @Ken, Jack is right – Have a look at project Gutenberg first if you are looking for free ebooks as they have a huge list of pre-1950’s books. I doubt you would be able to access Google Books from a Wifi enabled ebook reader either. Have you found books on Google Books that you cannot find anywhere else? If you download ebooks from either Project Gutenberg or purchased from an ebook store, saving the ebooks to your ebook reader is very easy, just plug the ebook reader in your computer and the software guides you. Hi I am thinking of buying an ebook reader, but need to know if I would still be able to see the screen, in sunshine with my sunglasses on as I know this is impossible with my mobile phone. My main reason for buying the ebook reader is to take it on holiday, so clarification of this is important to me. Ebook readers like the PRS-350 are ideal for holidays at the beach/pool as they are very readable in direct sunlight. You won’t have any problems with reading with your sunglasses as there is no glare from these types of screens. (This is not the case with the Apple Ipads though…). that it has expansion slots for memory stick duo and SD Card up to 32GB. Also it can be bought from whsmith. Check both stores for offers. I have one and have already finished a couple of books. My experience so far… plain awesome. Have not regretted the slightest for paying a bit more. Also linux friendly as it is seen as an external storage device. do any of the ereader books have a backlight which enables you to read in bed without any lights on? Sony claims that both PRS 350 and 650 have a Pearl E-ink display. They don’t. I have been checking in many shops (including Sony Centre) and all of them show Vizplex E-ink displays on their settings. @above. There is a free programme called Google Books Downloader which does exactly what its name says. 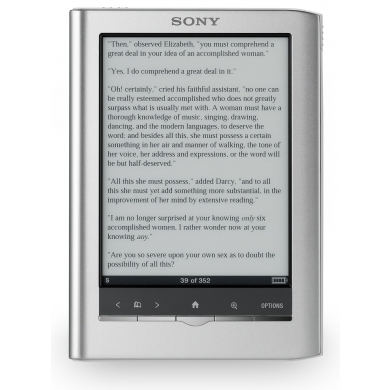 Are the Sony ereaders compatible with Mac OS X? I’m tempted to buy the Sony 350 but need to be sure it’ll work with my computer! I’d appreciate your advice on this.